A dust-up in a hotel lobby two years ago left a simmering grudge between Deontay Wilder and Dominic Breazeale, who will settle their differences May 18 at the Barclays Center in Brooklyn. The Bronze Bomber joined us Sunday for his fourth appearance on The Ringside Boxing Show to discuss the feud, Fury, Joshua, and why he walked away from a $100 million to fight for DAZN. 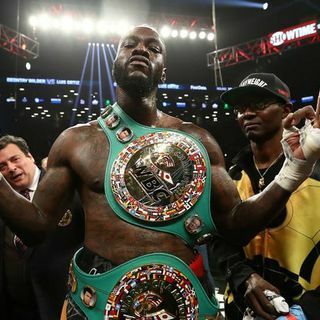 Wilder, always one of the best interviews in boxing, brings the heat, as usual, in this lively, in-depth interview. This ... See More action-pack show also includes an interview with smokin'-hot featherweight prospect Ruben Villa IV, who just learned he'll put his 15-0 record on the line in Showtime's main event on May 10 against the WBO's No. 11-rank contender, Luis Alberto Lopez (17-1, 9 KOs). We also hear from British correspondent Paul McLaughlin, who reviews Anthony Crolla's ill-fated challenge against Vasyl Lomachenko, and previews Saturday's upcoming fight against Terence Crawford, among other topics. And we lead off with our weekly conversation with expert analysts Travis Hartman, Rizwaan Zahid, and John J. Raspanti, who weigh in on multiple topics, including the impact of Claressa Shields' Showtime showcase against Christina Hammer, Gilberto Ramirez's place in the light heavyweight division, Mungia's close call against Dennis Hogan, a Crawford-Khan preview, Arnold Barboza's enlightening beatdown of Mike Alvarado, and much more.